Onpattro™ (patisiran) contains double-stranded small interfering ribonucleic acid. Image courtesy of Alnylam Pharmaceuticals Inc. Hereditary transthyretin-mediated amyloidosis is caused by the mutation of the transthyretin (TTR) protein found in the liver. 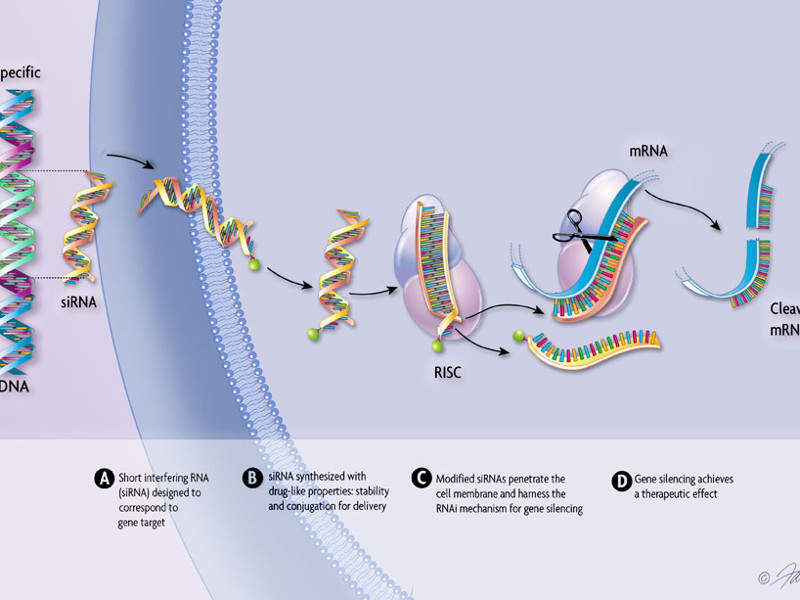 Onpattro™ (patisaran) is the first-of-its-kind RNA interference (RNAi)-based drug indicated for the treatment of polyneuropathy of hereditary transthyretin-mediated (hATTR) amyloidosis in adults. The drug was developed by Alnylam Pharmaceuticals. a biopharma company based in the US. The new drug application for patisiran was submitted to US Food and Drug Administration (FDA) in December 2017. The drug was approved by the FDA in August 2018 as the first drug for the treatment of polyneuropathy of hATTR. Alnylam submitted the marketing authorisation application (MAA) for patisiran to the European Medicines Agency (EMA) in December 2017. The European Commission’s decision on the approval of patisiran is expected in September 2018. The company also plans to submit regulatory applications for the approval of patisiran in other global markets such as Japan towards the end of 2018. Hereditary ATTR is a rare and progressive genetic disease caused by the misfolding or deformation of a protein called transthyretin (TTR), which is formed in the liver. The condition leads to the accumulation of amyloid deposits in various parts of the body including heart, nerve and gastrointestinal tract. Some common symptoms include numbness, pain and weakness in limb, cardiovascular issues, diarrhea, nausea, vomiting, and kidney dysfunction. The disease is estimated to affect approximately 50,000 patients globally. Onpattro™ contains patisaran, which is a double-stranded small interfering ribonucleic acid (siRNA) formulated in the form of a lipid complex. 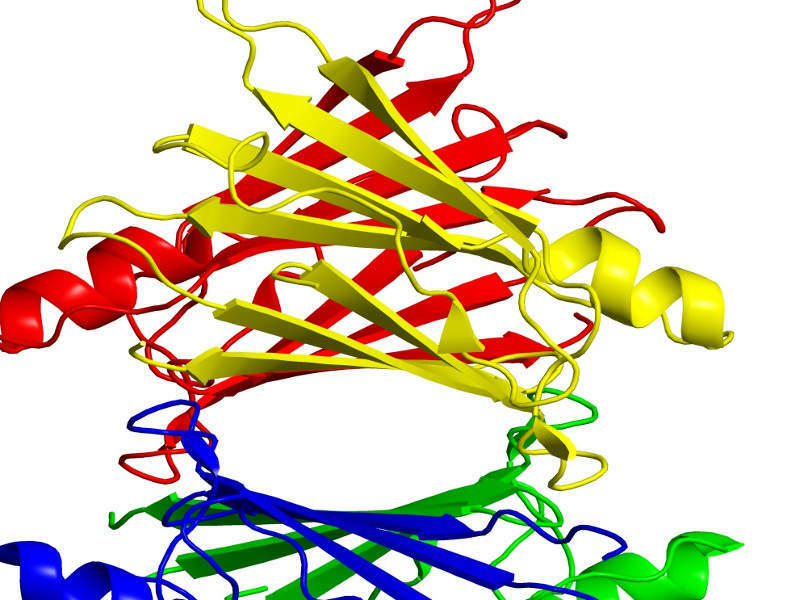 The drug binds to the TTR protein and prevents its deformation through the RNA interference. It helps in reducing the level of TTR protein made in the liver and the resultant amyloid deposits in the tissues. 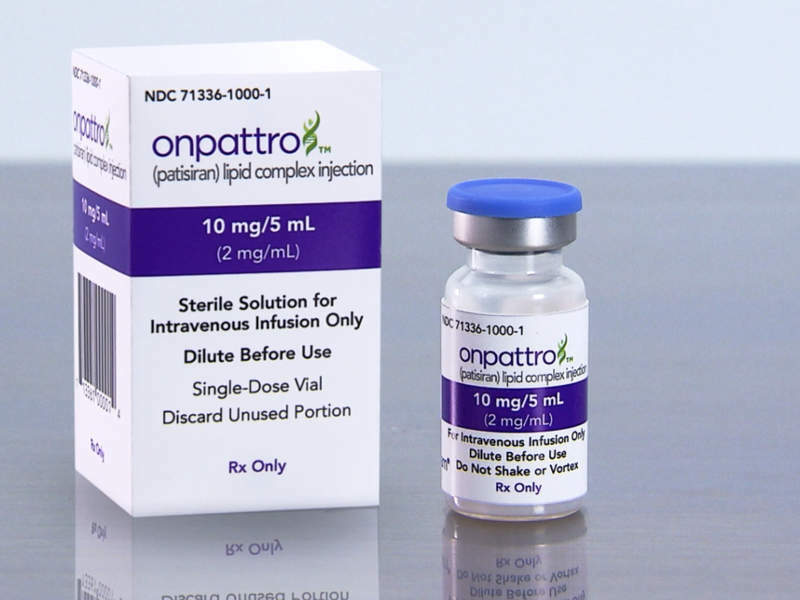 Onpattro™ lipid complex injection is available as white to off-white homogeneous formulation in a single-dose vial in 10mg per 5mL (2mg per mL) strength. The FDA approval of Onpattro™ was based on the positive results of a global phase III clinical trial named APOLLO. The FDA’s approval of Onpattro™ was based on the positive results of a global Phase III clinical trial named APOLLO. The APPOLO trial was a randomised, double-blind, placebo-controlled, clinical study performed to evaluate the safety and efficacy of the drug in patients. A total of 225 patients were enrolled for the trial and randomised to Onpattro™ and placebo in a 2:1 ratio for 18 months. Out of the total 225 patients, 148 received Onpattro™ (0.3mg per kg of body weight) once in every three weeks and the remaining 77 patients received placebo. The primary endpoint of the study was modification in the Neuropathy Impairment Score +7 (mNIS+7) from baseline at 18 months. The score is used to assess the improvement in motor skills, nerve conduction and postural blood pressure of the patients. Patients receiving intravenous Onpattro™ infusion demonstrated measurable improvements in symptoms including polyneuropathy, daily activity performance, quality of life, and ambulation nutritional status, among others. Further, 51% of the patients treated with Onpattro™ showed improvement in quality of life measured by the Norfolk Quality of Life Diabetic Neuropathy (QoL-DN) compared to 10% of those treated with placebo. The most common adverse events reported in the trial were upper respiratory tract infections and infusion-related reactions, while back pain, abdominal pain and headache were some of the symptoms associated with infusion-related reactions (IRRs). Headquartered in Massachusetts, US, Alnylam is a biopharmaceutical company focused on the development of innovative RNAi-based therapeutics to treat various diseases. The company’s pipeline contains innovative investigational therapeutics under broad areas such as genetic medicines, cardio-metabolic diseases, hepatic infectious diseases and central nervous system diseases. Some of the late-stage pipeline products of the company include givosiran, fitusiran, and inclisiran.